Dust is present on all the surfaces of your office. Dust is made up of dead skin cells, pollens, soil, and dirt particles — all of which provide a thriving environment for dust mites. When allergy sufferers breathe in a dusty environment, their health is affected, triggering symptoms of asthma or allergic reactions like dermatitis. Let’s explore how you can vacuum to keep the carpets clean, minimizing the allergens in your office. It is important to clean the carpets with vacuum cleaners at least twice a week if you have people allergic to dust working in the office. In order to reduce the allergens from the carpets, it is important that you make use of a vacuum cleaner consisting of high efficiency particulate arresting (HEPA) filters. This is because HEPA filters are efficient at trapping very fine particles like pollens, mites and mite feces. You would want your maintenance cleaning to go perfect, right? 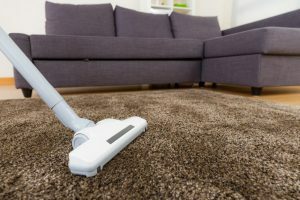 Therefore, continue reading to make sure that you are vacuuming the carpets properly. Even if your vacuum cleaners do not have a bag, verify that the dust containers are not full. Full bags reduce the suction power of the bags. Wear a mask when emptying the dust bags. Bunches of hair, wrappers, and debris block the brush bars. This could destroy the motor of the vacuum cleaner and reduce the efficacy as well. Make sure that the vacuum cleaner that you are using has relevant attachments so that you can clean the upholstery and the curtains too. • Remove all the large debris in your path so that the brush bars do not get clogged by them. • Pass the vacuum cleaner over each and every area of the carpet at least four times in order to remove the dust particles and allergen effectively. • Move the vacuum cleaner slowly and gradually to provide sufficient time for the suction. • Do not press the vacuum cleaner hard downwards, or else you will end up destroying the pile of the carpet. Extra Hand Services provide high-quality professional commercial carpet cleaning services. The experienced professional cleaners make sure that the carpets are cleaned in a way that the dust and allergens are eliminated from your office environment. Vacuuming also extends the life of your carpets greatly, even the ones installed at high-traffic areas.